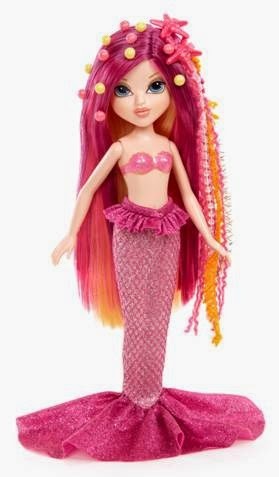 This sparkly, colourful doll is one of the new Moxie Girlz FantaSea Hair dolls. Lara is now 5 and I really wish you could have seen the sparkle of delight in her eyes when she first laid eyes on this Moxie Girlz doll. Between the two of us, it took us quite some time to fight our way in through the packaging to lift her out. This is Avery who comes in beautiful deep pink colours but you can also find Monet (greens and blues) and Sophine (purples). These dolls are styled like a mermaid but you can also remove their tail / ruffled skirt to see their swimming costume beneath (it is painted on). What is it with little girls wanting to remove the skirts from their dolls? The FantaSea hair dolls feature a two-tone coloured streak of hair which Lara absolutely loves to brush and style. The doll comes with a brush, two clips in the shape of starfish, several colourful hair extension(that look like shells, seaweed and colour-coordinated sparkliness) and also a selection of contrasting coloured 'pearls' which stick to the hair. I thought the clips and hair strands were brilliant because they really change the style of the doll and are easy for Lara to put into the Moxie Girlz' hair or even into her own hair. The little coloured pearls were a nightmare though - they didn't stay in the hair very well and were very quickly lost around the house. Lara hasn't yet tried her Fantasea hair doll in the bath but I think it would probably work well as long as you give the hair a good brush afterwards - I'd also be tempted to take the sparkly mermaid skirt off as well as it looks too special to get wet! And I think there's the reason why I like this doll - it feels special. The sparkly, fashionable ruffled outfit, colourful hair and subtle 'make-up' on the Moxie Girlz doll make this feel a bit more grown up than many of the toys Lara has played with until now and the styling is modern and imaginative. Having seen Lara relax in the evening before bed sitting watching television and brushing Avery's hair, I can well imagine her also enjoying the hair torsos that are part of the FantaSea range which allow further mermaid hair styling. I also think that Lara's Avery doll would work best in the bath with one of the other dolls from the range to keep her company as I think this would really encourage role play and imagination.